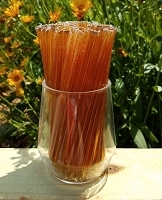 Please note that some of the honey may and will be crystallized as this is raw honey and has never been heated - i.e. raw goldenrod crystallizes within hours of coming off the beehive. 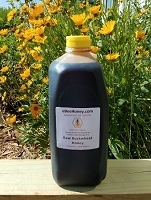 We do not heat any of our raw honey varieties. 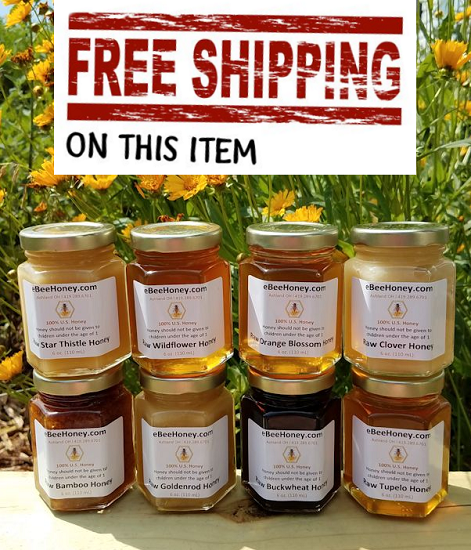 Get 8 varieties of raw honey in 6 oz. jars. See our honey description page for more information on the honey varieties. This is the 2nd time I've ordered this bundle and am not disappointed. A flavor for every tea or spread that I'm in the mood for at any time. Perfect flavors. All the honeys taste so different from each other. Certain flavors would be good for certain things , like on oatmeal, toast or sweetening stir fry. It was so cool to be able to try all of them so we know which ones we'd order in a bigger size while still getting to enjoy a small size of the others. They promptly sent an email confirmation of the order. They shipped it quickly and it arrived packaged very well. The honey was well protected and packaged for shipping. The honey itself is great. The flavors range from strong and savory with the buckwheat and bamboo varieties to sweet and exotic with the orange blossom and star thistle. Each variety has a unique flavor. All are good but I especially like the orange blossom and star thistle varieties!